Naming South America’s most prominent wine producing countries is easy; by now even those with only a modest interest in wine will have tasted a Chilean Sauvignon Blanc or Argentine Malbec. But still relatively under the radar are two other significant wine producing nations: Uruguay, which has developed a good reputation for Tannat in particular, and Brazil. In fact, Brazil holds third spot in South American wine production, with a developing fine wine industry and appreciative local fan base. That’s perhaps not so surprising given that Brazil is the eigth largest economy in the world, and has the 5th largest population of all countries, dwarfing Argentina and Chile. What’s more surprising perhaps, is that Brazil has the conditions for quality wine production. Our image tends to be of the Amazon and rain forest, or the sandy beaches of the coast. But travel to the deep south of this huge country and, bordering Argentina and Uruguay, latitude and altitude give ideal conditions. 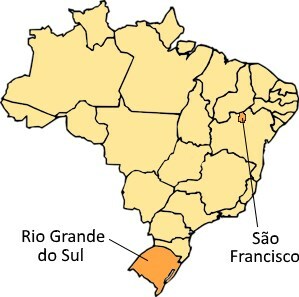 This is the Rio Grande do Sul province, home to 90% of wine vineyards and production, the area known as Serra Gaúcha the heartland of the fine wine industry. With vineyards rising to over 700 metres in the hills, and temperature and humidity moderated by its southerly location, the landscape is rural and would be familiar to the Italian and other European settlers who brought vine growing traditions to the area. The isolated São Francisco region in the more tropical north is an oddity: with a year-round temperature of around 30ºC, vineyards here are mostly for table grapes and produce two, sometimes three crops per year with sophisticated irrigation systems, but there is some good quality wine being made. Go Brazil is the UK’s only company specialising in the wines of Brazil, importing wine directly from Serra Gaúcha and other prime regions. Established in 2010, Go Brazil distributes wines in the UK, Ireland and Europe, with direct customer sales in the UK via gobrazilwines.com. The company represents the wines of a dozen of the country’s top producers, sparkling, still and sweet, as well as cachaça, the sugarcane-based spirit that is the national drink of Brazil with origins dating back to the 1500s. Owner Nicholas Corfe explains that different cultural ‘waves’ have introduced and influenced vine-growing and winemaking, from the Portugeuse who ‘discovered’ Brazil in the 1500s, through Jesuit missionaries, and most importantly, the influx of Italian immigrants in the 19th century. Although there is 150 years of wine-making tradition, Nicholas also points out that the last decade or so has seen a massive surge quality, and that in the October 2018 edition of Decanter magazine, 17 of 20 Brazilian wines tasted were awarded 90 points or more. 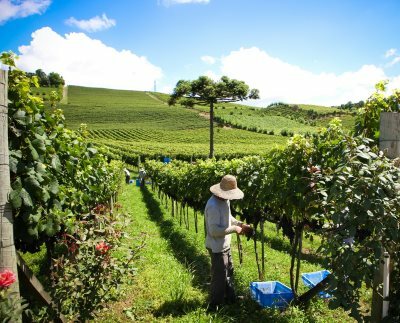 Brazil does not have indigenous wine grape varieties, and while the Italian heritage means there are some plantings of Nebbiolo, Teroldego and Ancellota, for example, it is the French ‘international’ varieties that dominate. A lot of the Chardonnay and Pinot Noir goes to sparkling wine, a real strength of Brazil (and Brazilians love their fizz), made as serious traditional method wine with the likes of Moët and Chandon producing excellent wines there, and also as perhaps more frivolous tank-method wines made from Muscat. Go Brazil recently sent me samples of the six wines below to try for myself, including an excellent traditional method sparkling wine, a crisp Riesling and some really interesting reds. The great news for those holding tickets for my Festivals of Wine in 2019 is that Go Brazil will be there, with a wide selection of their wines available to taste. (2019) Owner Mario Geisse was in charge of winemaking at Moet & Chandon’s Brazilian operation before setting up n his own in 1979, with vineyards at 800 metres, growing Pinot Noir and Chardonnay. Aged 24 months on the lees, this really is a beautiful, and classic traditional method sparkling wine, 70% Chardonnay and rich with confit lemon, almond and creamy, biscuity richness, the mousse plush and mouth-filling. On the palate there's pin-sharp precision of flavours and acidity, but a generous personality too, the intrinsic sweet ripeness of the fruit perfectly matching the razor-sharp acidity. A class act this, Franciacorta softness meets Champagne precision. (2019) Throughout central Europe, wines labeled 'Riesling' are often made from Welschriesling rather than the Rhine Riesling of Germany's top wines, an unrelated grape variety that tends to produce aromatic and crisp, easy-drinking wines. Such is precisely the case here, a particularly fragrant example with lemon verbena, apple and a touch of floral character. In the mouth it is all about the zesty freshness of apple and lime, but gentle, the acidity matched by just a touch of background sugar perhaps. (2019) Made by Michel Fabre, French owner-winemaker for Fabre-Montmayou in Argentina, and his own excellent estate in Cahors, this blends Tannat, Cabernet Sauvignon and Ruby Cabernet. A deep violet/crimson colour, it's a bit more classical, more European in style than the Don Guerino Malbec for example, with meatier black fruit, though still with a cassis ripeness and a bit of violet lift emerging. In the mouth a leathery, coffeeish, deeply-hued set of flavours, a lot of fruit sweetness here though, the finish quite sweet with smooth texture and rounded tannin and acid balance. (2018) Oenologist Bruno Motter studied winemaking in Mendoza, Argentina, which perhaps has helped him coax such an expressive Malbec from these hillside vineyards at around 500-metres altitude. In some ways this is a super-charged example, heaving with chocolate and mulberry, a raspberry ripple, creamy density of fruit, and yet it has elegance too. Six months in French and American oak adds to that cocoa depth, but there is such pure red fruit at the core of this, a soft but tight-grained tannin structure, and fine cherry acidity, that it is pretty and poised too. A big, open-armed crowd-pleaser and excellent. (2019) A muscular, meaty, meat-stocky aromas for this Brazilian Tannat from the Pizzato family, who are of Italian origin. A woodsmoke and vanilla character, loads of spices and warming fireside tones, just glimpses of a ripe, more vibrant black fruit beneath. In the mouth this is an all-encompassing, bear-hug of a wine, ripe and sweet black fruit floods the mid-palate, that creamy and smoky depth of oak supporting, but the edge of freshness to the tannins and the nippy, alert acidity gives lovely balance. (2019) The northern Italian variety Teroldego, grown here in the hills of Serra Gaúcha. Black as pitch, the nose here is smoky and meaty, a wisp of bonfire smoke, but then a more floral, exotically spicy aspect comes through, a touch old roses and a deep blue-black fruitiness. In the mouth there's a juicy cherry and raspberry intensity here, that smokiness wreathed through the fruit, the tannins firm but not stern, and the balanced acidity giving a long, fruit-driven finish.